Every now and again I’ll pick up a book from the bookstore without knowing anything about it. I know, it seems wild right? Picking up a book without reading the jacket, having it recommended by a friend, or consulting Goodreads first. There’s something liberating about having no expectations apart from your initial judgement of the cover. That’s exactly what I did with Eleanor Oliphant. I had seen the book in passing several times, and picked it up with no real information about it. While choosing books in this manor can lead to some very hit or miss reads, Eleanor Oliphant is Completely Fine was one of my favorite reads of 2018. 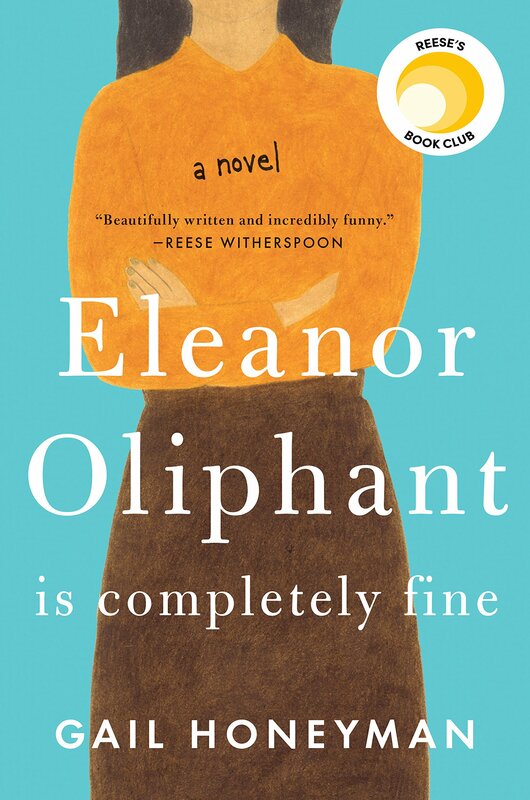 Eleanor Oliphant is Completely Fine is about the life of Eleanor Oliphant. She leads a excessively structured life: everything from meals to her drinking habits to her weekly contact with her mother is planned to the hour. As the title implies – her life is fine, nothing less and certainly nothing more: she lives to exist, not to enjoy herself. When she goes to a concert and instantly forms a crush on the lead singer, Eleanor is spurred to start engaging in life. She sets out to catch the attention of the singer and ends up making unlikely friends, stumbling through her burgeoning social life. What I really loved about this book was that Eleanor’s awkwardness and behavior was never downplayed. She was never toned down so as to fit into the quirky cute nerd or manic-pixie-girl tropes. She’s thoroughly disillusioned with life, doesn’t care what others think of her, and can’t make heads or tails of most social situations. Her lack of social understanding was almost painful at times – you almost want to yell at her when she bungles situations – it really drives home just how socially underdeveloped she is. It’s her character definition that I adored – and with it, the growth we as readers get to see her go through. She grew at a realistic pace, making blunders along the way but never losing what made her Eleanor. For all Eleanor is chasing the lead singer of the band – it’s starkly refreshing that the book isn’t wholly centered around Eleanor falling in love or entering a relationship. It’s first and foremost about Eleanor finding the strength to process what she’s been through in her life (which is A LOT), and it’s not cheapened by a gimmicky happily ever after. One of the biggest ways Eleanor grows is through her friendship with Raymond, who unwittingly pushes her limits and helps her truly experience life. If you do happen to read the summary of this book – know that it is fairly misleading. I don’t want to spoil anything (because the surprising turn the book took was one of my favorite parts), but be aware that there is a very dark plot that defines who Eleanor is and drives some of her startling actions. Without giving too much away, there is a definite mystery undertone to later half of this book. Deeply honest, overwhelmingly emotional and a touch thrilling, Eleanor Oliphant is one of the best books I’ve read in a long time. Do yourself a favor and don’t research this book before you read it – dive in as blind as possible and enjoy this fantastic book. I enjoyed that book for the same reasons. I also had heard very little of it before listening to it as an audiobook. I was (positively) surprised by how much deeper the plotline went than what the first few pages promised. I loved this book so much, especially towards the end. It seems like all of the book clubs in my area this month are reading this book in January so I am so excited to go and talk about it with different people, even though I haven’t read it in like a year. I never even thought of reading this one, but now I actually want to. I can’t get a copy, so sad. anyway I’ll get one from the library. I read this book and I absolutely loved it! It took me a few chapters to get into the story, but after that I couldn’t out it down! Such a brilliant plot! This was my favourite book of 2018 by far! Great review! I’ve heard really good things about this book. This shows that I have been narrow minded in my choices.. Time to diversify.. This is a popular one I’ve heard nothing but good things. I’m glad you enjoyed it. I knew that Eleanor Oliphant was socially awkward but didn’t know much about it besides that. The dark element that you described and the leader singer thing definitely intrigued me! Everyone seems to be enjoying this one a lot! I’m glad you did too. Everyone seems to enjoy this book. Great review. I haven’t read the synopsis for this one but all the reviews I’ve read have been positive. I’m looking forward to “blindly” reading it 🙂 Great review! Great review, I been seeing this book around lately and I’ve been hearing great things about this book. I’m glad you fully enjoyed this book, thank you so much for sharing your awesome post. I read this a while back and loved it! It was one of my favorites from last year. Glad you enjoyed it too! Every once in a while I will pick up a book without really knowing anything about it. This one has been on my TBR for the longest time but, to be honest, I really didn’t know much about it. Great review!